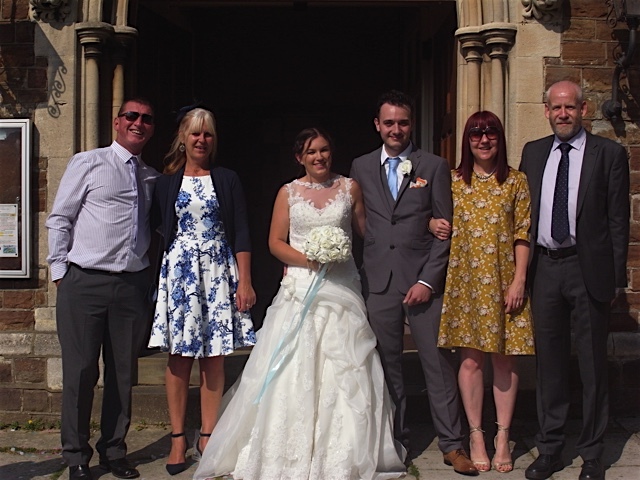 Went to the wedding of my middle Niece Kim last month. I wore this.. Which I wore to a wedding reception at the beginning of the year. Very happy to have worn it more than once, as its the most expensive fabric I’ve bought yet! Here’s a pic of the lovely Bride and Groom and the Brides aunts my Sister and I, and our other halves. 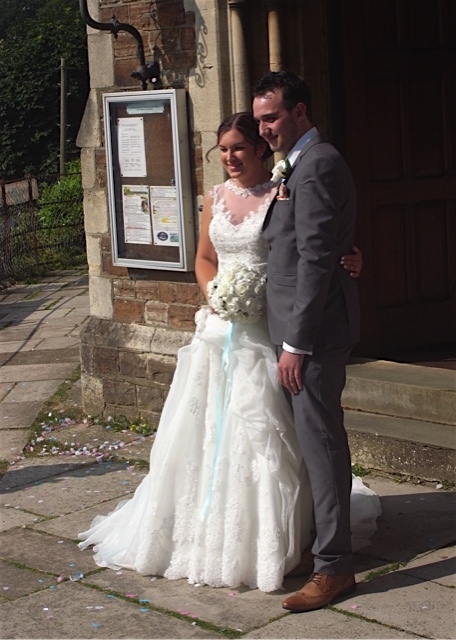 And the beautiful Bride and her Groom. Her dress was stunning, I especially loved the skirt. Was not made by me! It was a fabulous wedding. Been so long since I’ve been to a family wedding and it was much fun. Looking forward to the next one now and wondering what I’ll make for that? I’ve been wanting to make a new bag for a few months now. I had an idea of how big I wanted it to be and how long I wanted the handles. However I was procrastinating over this idea for the longest time because I knew I was going to have to draft the pieces myself and I’ve been spoilt with using patterns now (you might recall if you’ve been reading my blog from the beginning that I used to draft all my makes myself) and even though I was still going to be using a very simple shape I was feeling too lazy to do all the measuring out that I used to do when making a bag. 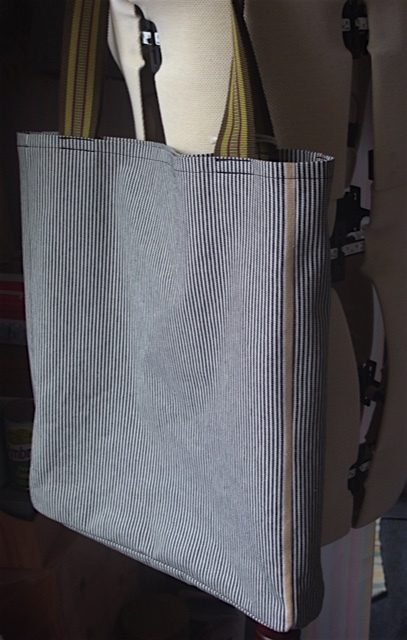 also the bags I used to make all had several layers and this was very time consuming. 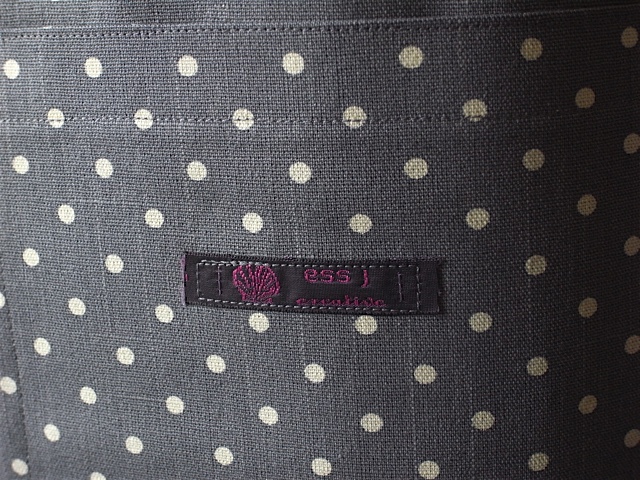 Plus I hadn’t really come across any fabric that I really wanted to make a bag out of recently. 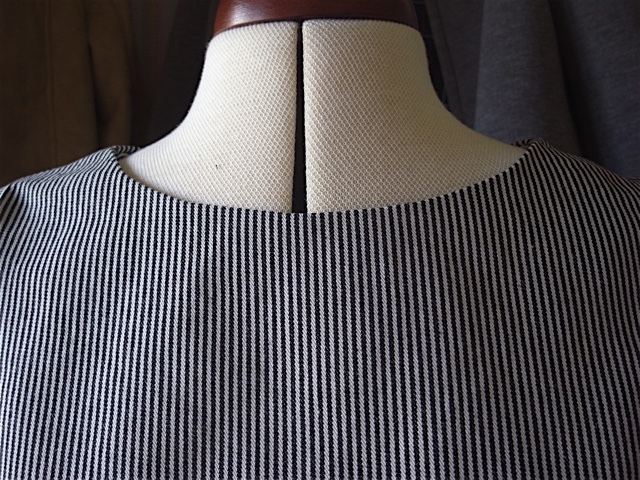 Until the striped denim from Merchant and Mills, that I’d made a top out of. I had a feeling it would work really well as a bag. I cheated with the cutting out and took a bit of a gamble. I didn’t mark anything out at all. I just used my tape measure to guide me, and cut along it. I also folded the fabric so I’d only have to cut out a piece once. This seriously reduced the time it took. And for the most part the pieces were pretty even, so I was quite happy with that. 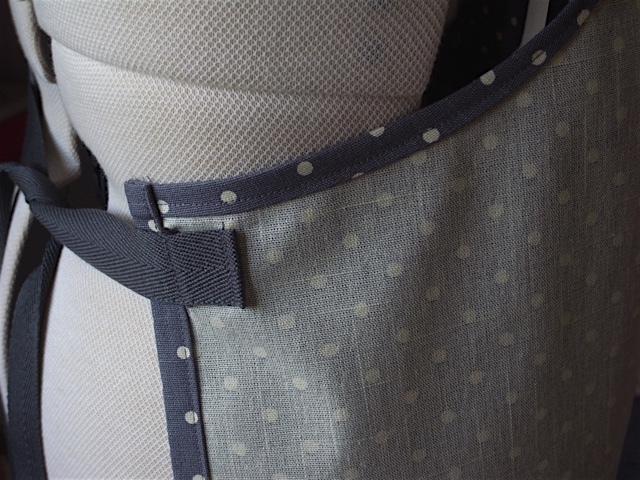 I didn’t line this bag as the denim is fairly robust and sturdy and I also like how the fabric looks on the reverse. 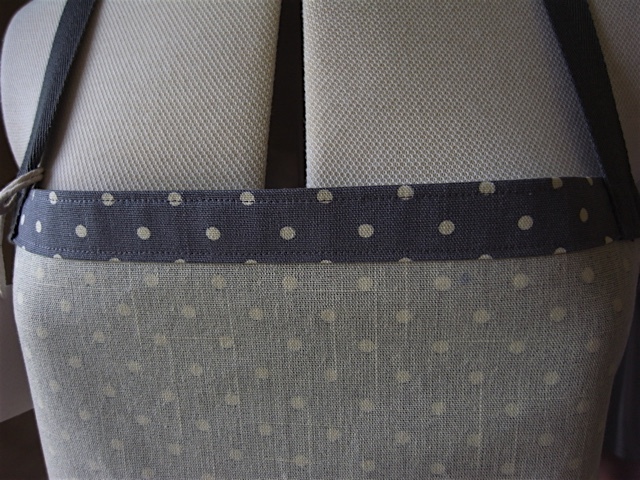 I used some grosgrain strapping that I’d had in my stash for a while, also bought from Merchant and Mills. 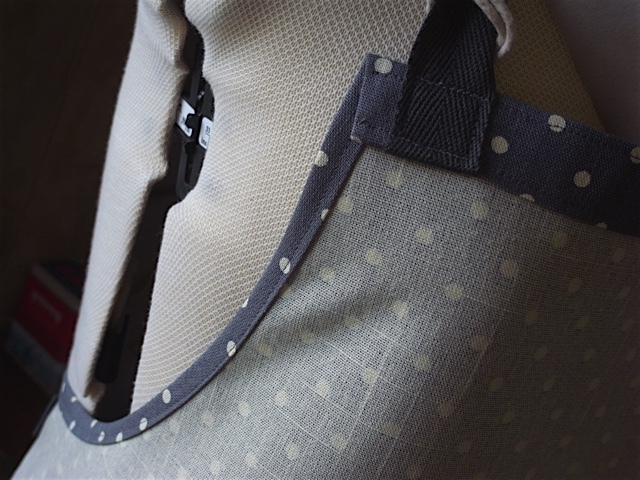 I like how the straps contrast nicely with the bag fabric. 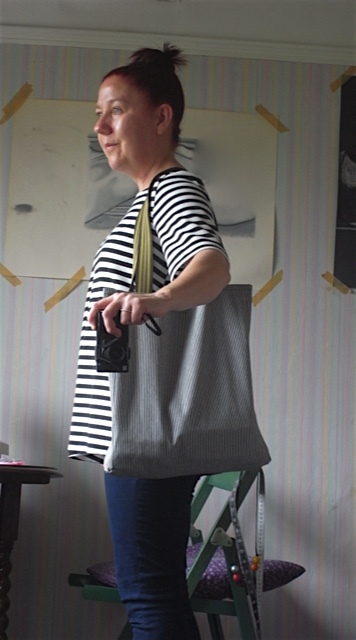 I’m very happy with my lovely new bag and I was right, the fabric does work really as a bag. 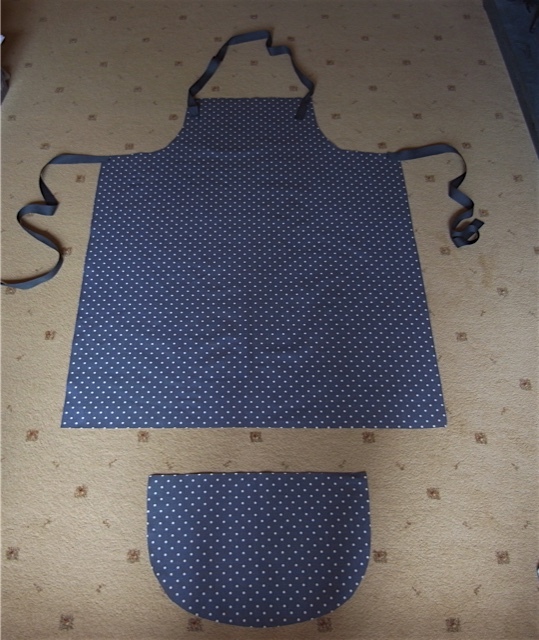 I think I’ve finally got the dimensions and strap length right for a very useful bag. Its comfortable on the shoulder and holds a lot of stuff. Here I am wearing it with dress and necklace also made by me. Walked into town on one of the hottest days of the year so far, back in July, and I was very comfortable (within reason ) in dress and carrying bag. Not too heavy, even when full of shopping. My Niece loved it too, and so I made her one. Hers is a little different and also a bit better made than mine. 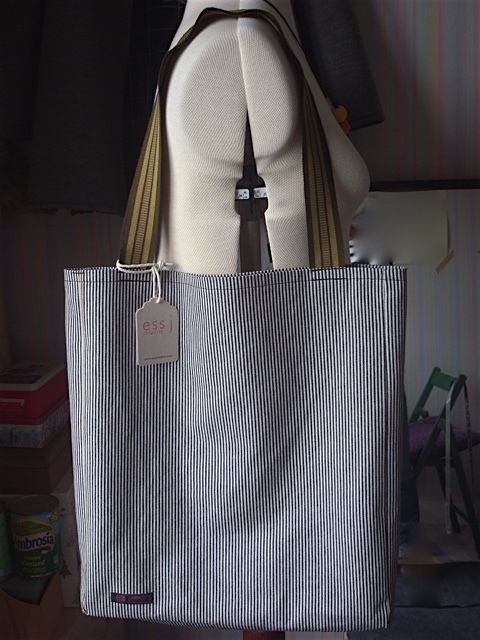 Although mine is not badly made, but it had been a while since I last made a bag. So making a second so soon after meant it was all fresh in my mind and therefore I feel I did a better job of it. I also managed to get some of the selvedge to show, which I had tried to do with mine but it didn’t work. I added my label to hers too. I never think to add a label when its for me. 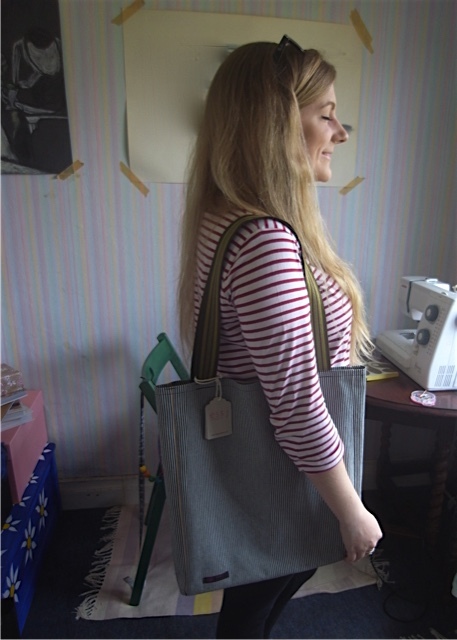 And here’s a modelling pic of my lovely Niece Zoe with her exclusive bag! She’s very talented and has her own Etsy shop, Meemalz, where she sells miniature clay animals, and takes custom orders for your very own miniature pet. Follow the link and take a look. So my Mums Birthday was coming up and I had not got a clue what to buy her. 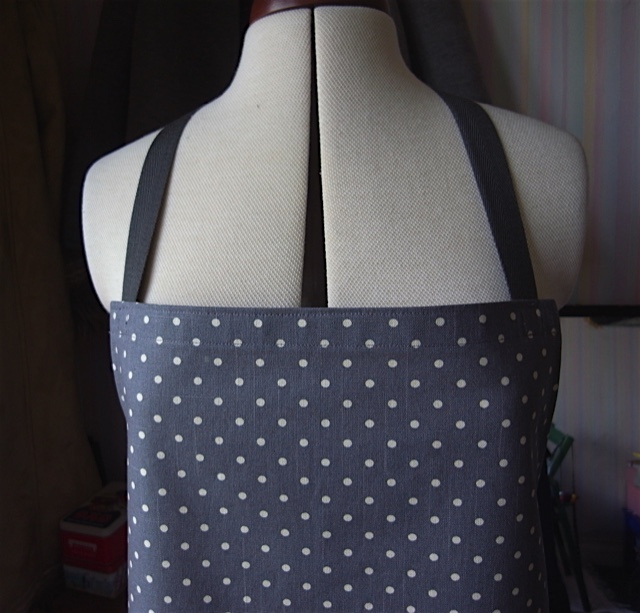 After giving it some thought I decided to make her a new apron, she loves her aprons and is always wearing one. 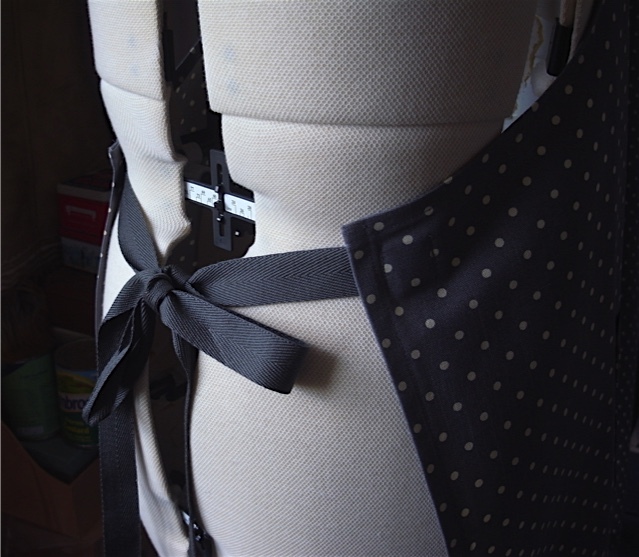 I quite enjoyed deciding on what fabric to get and finding the matching thread and strapping for the ties. Took me ages to make a decision. 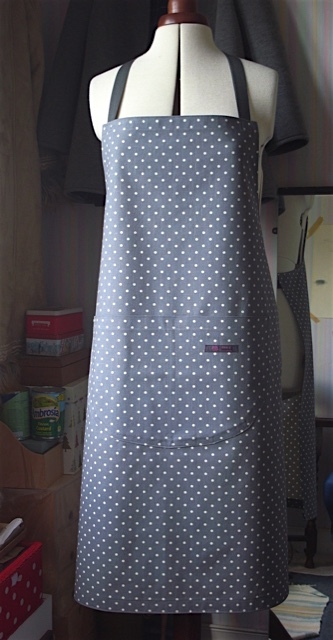 I ended up with a gorgeous grey and cream spotty fabric, which works really well as an apron. I find it a very satisfying thing to make actually. Took me about 4 hours, and this one is even neater than my first one. I’m quite proud of it I have to say. And my Mum was very happy with it too! Below are the pieces, cut out and ready to put together. 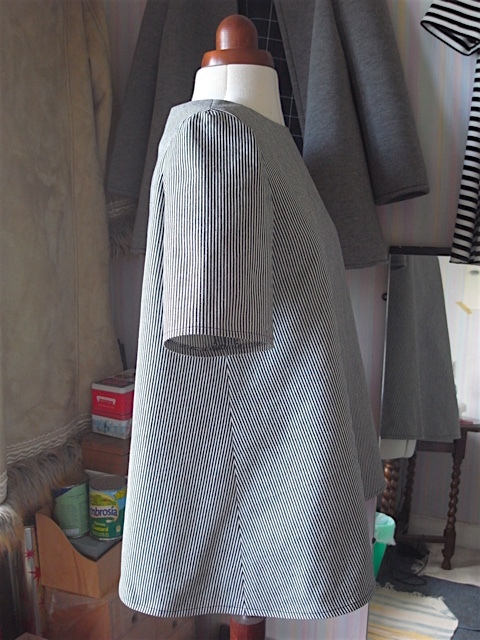 I zigzagged all the edges first, this fabric was quite good at fraying. Very happy with the curves at the sides. Cost me more to make it than it would to buy one, but I feel you can see the quality in the fabric and the finishing, even if I do say so myself! 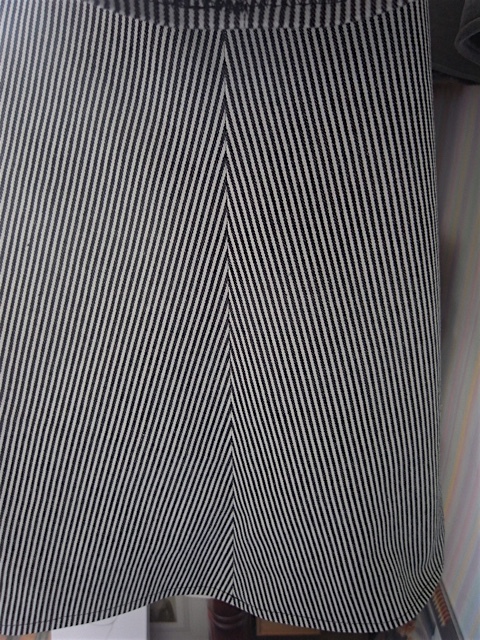 I bought some gorgeous 11oz stripey denim from good old Merchant and Mills and silly me I didn’t realise till I got it home that the stripes ran vertically and not horizontally. I don’t know why I was surprised as its happened several times before. Anyway I was slightly disappointed as for some reason I’m really not keen on vertical stripes, and was wondering if I could get away with using the fabric so the stripes would be horizontal, but decided against it as I felt there would be no give in the fabric where I needed it once it was made up. Oh and just as an aside I had planned to make something different. 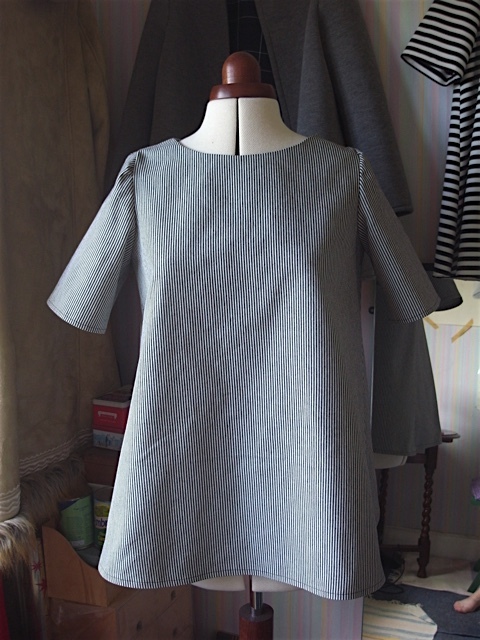 I was going to make the Merchant and Mills Union dress, I have the pattern. So as I’m lucky enough to live not far from Rye I am able to visit their lovely shop quite often. 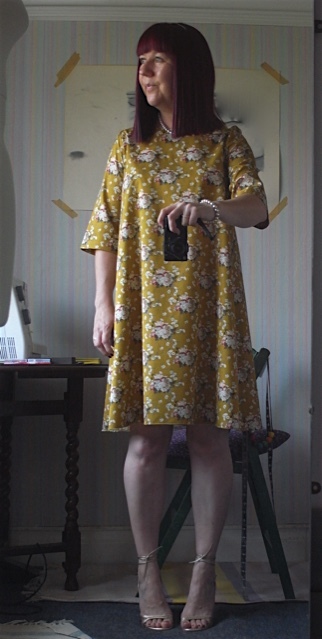 I tried on 2 of the Union dress samples in a size 10 and 12, and well lets just say it did me no favours. A bit like the Top 64, which I made and hated. So I’m afraid for now I’m sticking with the Trapeze pattern. I did however get to see a toile of their newest pattern offering and let me tell you its gorgeous! And I didn’t end up wasting an awful lot of time making something that I was never going to wear. On the way home I became a bit concerned about the weight of the fabric too. 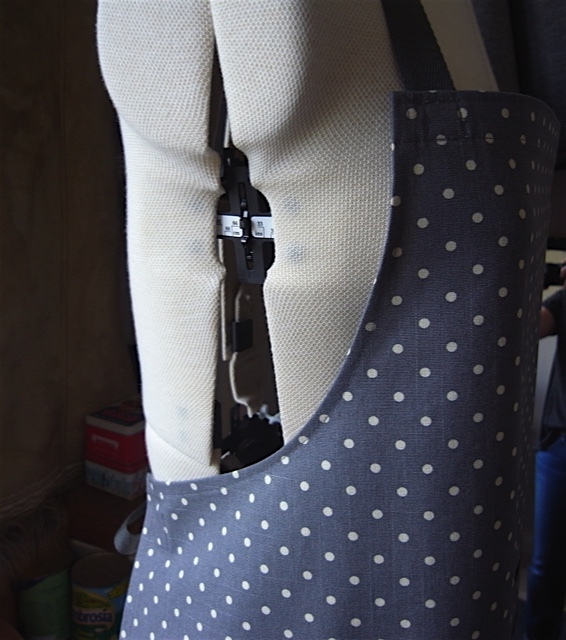 I’ve already made the Trapeze up in a denim, firstly an 8oz denim and a 5oz dress weight denim. The 8oz is quite sturdy and results in a fairly structural garment whilst the 5oz is a lovely soft denim which drakes a bit better. 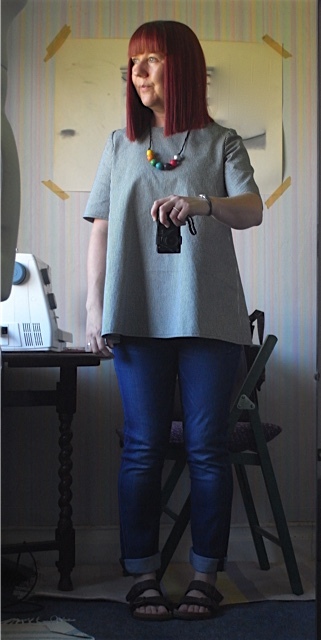 So I suddenly had a moment of panic about the 11oz, thinking it was going to be too rigid. I managed to allay my fears until the moment I got it out of the washing machine when it felt like very stiff cardboard! It had somehow felt a lot more pliable and softer in the shop. I was a little unhappy with my decision and wasn’t entirely sure if I was going to make a Trapeze with it. Plus I was stuck with 3 metres of the stuff! Next day though I decided to plough on. I’d had the fabric cut into a 1 metre and a 2 metre piece to save me from trying to wrestle a 3 metre piece of fabric in my living room. 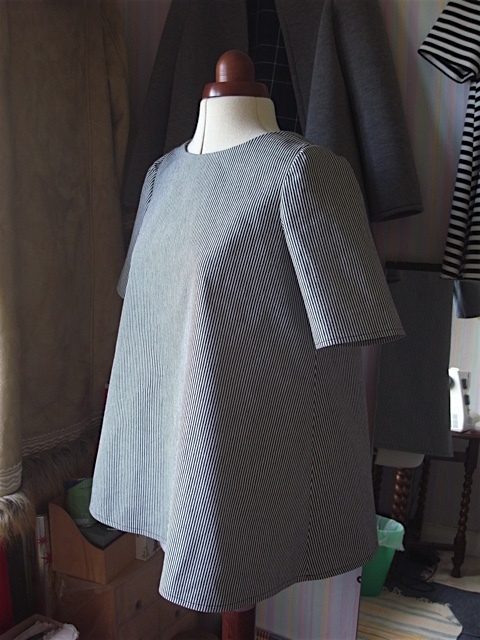 I started with the 1 metre piece and made a Trapeze top. And I have to say that although I wasn’t exactly excited about this project the denim was a joy to work with. It behaved and went where I wanted it to go and did what it was told. The thin stripes were a little bad for the eyes at times though, I have to say. Now considering I don’t like vertical stripes on clothes and the fabric was a little too thick in my opinion, I ended up quite pleased with it. 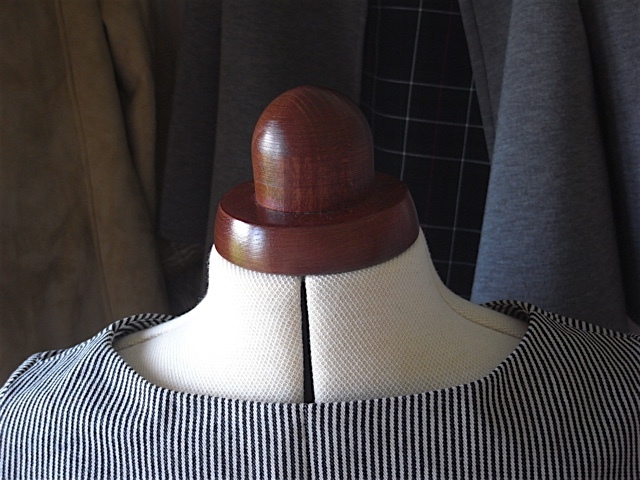 This is one of the nicest crispest necklines I have ever produced. 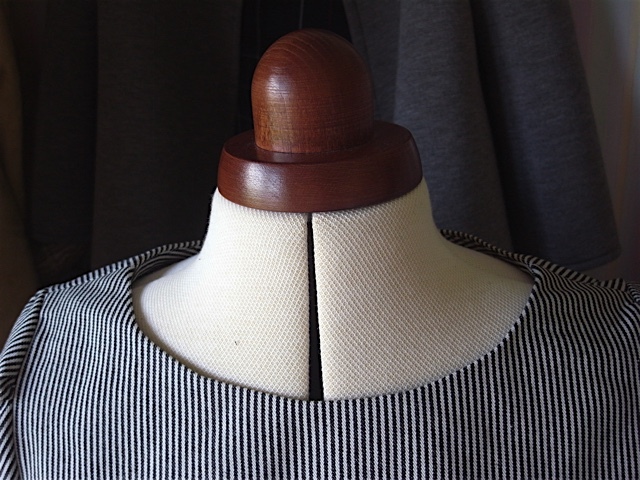 And I’ve become rather taken with those stripes, looks a bit like a humbug. 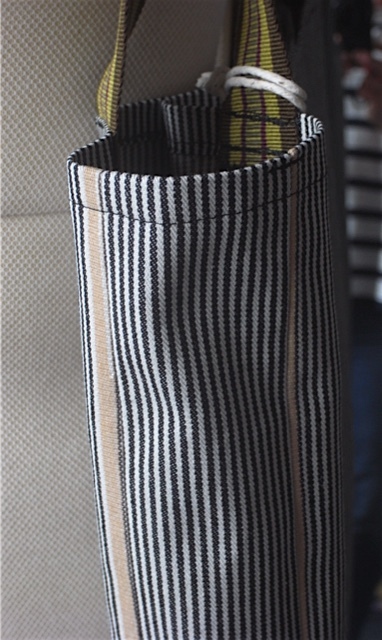 And because of the vertical stripes, pattern matching wasn’t much of an issue. Which is always a plus in my eyes. Look at the side seam. And the centre back seam looks almost invisible, particularly at he top. Now for rest of the pics. It does have quite a structured look about it still, but I like it. I love that it holds its shape. 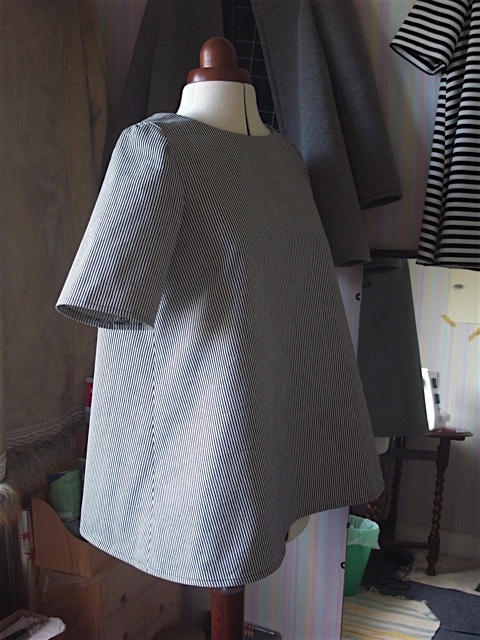 Unfortunately I still haven’t mastered putting in smooth sleeves, there are tucks and puckers, Patrick Grant and Esme would be horrified! But I put up with it. It was a pleasure to wear and I felt really good in it. 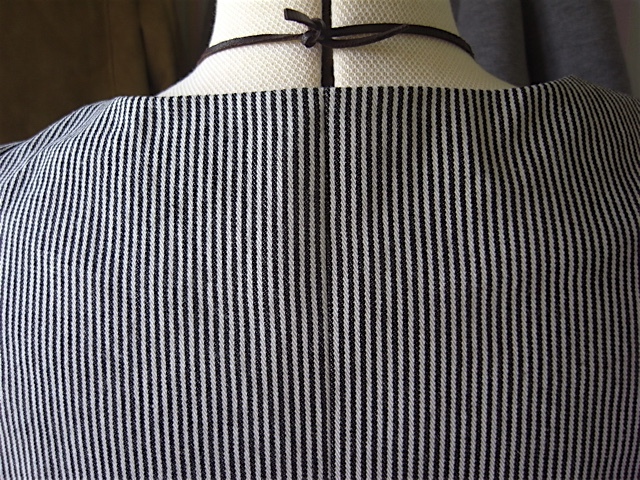 I am now a convert to the vertical stripes, but not sure if only like them as they are very thin. 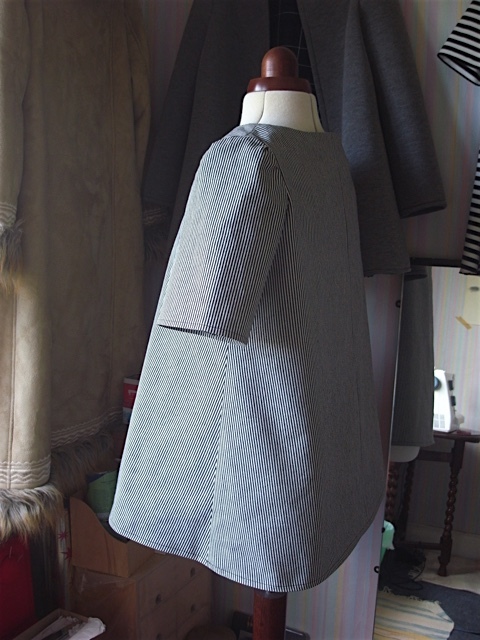 And from a distance the fabric almost looks plain grey. And now instead of despairing that I have 3 metres of the stuff, I’m looking forward to making another one for sure but maybe a third too. Not sure yet, might end up making a bag. I think the fabric would work really well and look good as a bag.